Finally the major competitions are out of the way, and the Norwegians and other holiday makers have made their way home. So a few months with less pressure on the committee until the first major of 2016, the Anniversary trophy on February 6th. We had 56 players (all turned up for a change!) for the aggregate stableford where both scores are added together at the end of play. My partner, Peter Reeves, had an excellent round of 37pts, but I let him down badly. I told him though that I fully expected to win a prize in the free draw, which I duly did, so getting a reward for my poor play. Poor old Peter got nada, which is one of the peculiarities of the format. His score would have won division 2 on any other day. But I must say, that his unusual route to the 9th green paid dividends when he managed to get his 2 pts – I got nothing! we’ve all been here by the bunker on the 1st hole, but not playing our 3rd to the 9th……..
Not always the case that the best score wins, but Gunner had 42pts. Only 2nd……. Thanks to a couple of members who have made donations to the prize fund – Jim Hershaw has in the past donated polo shirts etc. and has just left several caps and prizes more suitable to the ladies for a change. Also Dave Cook has replenished our stock of balls, which have been used as a reward for a two in our competitions………….so many I could hardly carry them…………. These are just a couple of examples of how members show their appreciation for the work done by the society on the members behalf. Sorry Ken, I didn’t let the truth spoil a good story…………..you were actually playing 3 after relief from the lake, but you wanted to say that you reached the ladies tee! 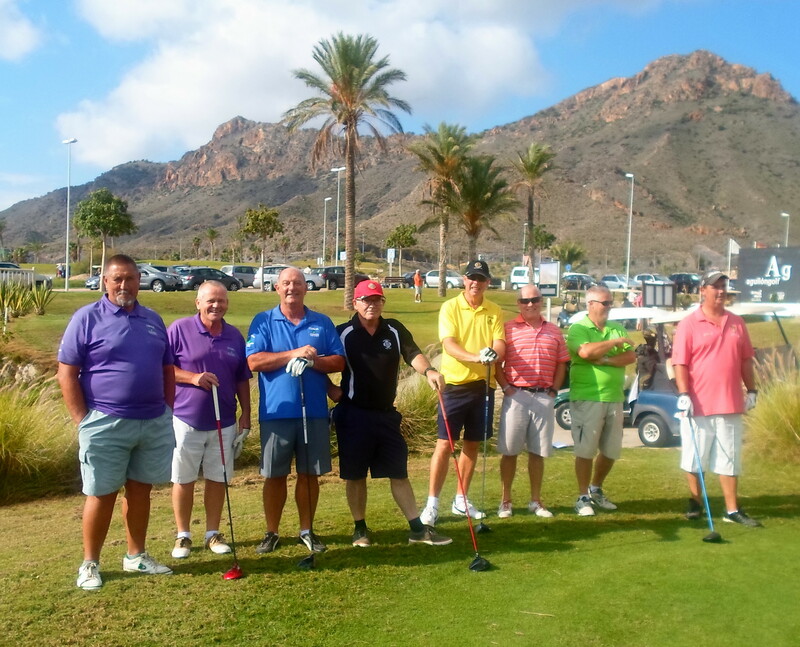 Also, whilst Phil did hit a duck full on, the one that Ken has was from a previous incident…………..
La Torre is a lovely setting, here Jim Creamer has just cleared Ken’s lake but found the bunker……..also my tee shot on the 4th is on one of those balconies…. As of November 1st, the online booking facility will no longer be available. After several months of usage it has proved to be unfair to members on site. Players can still ask friends to add name to start sheet once it becomes available. These were the photographs of the pairings (a pity some couldn’t wait for the photoshoot) and results of the matchplay section of the competition. Sorry for another email but i forgot (its an age thing) to ask those who have qualified that as well as their exact handicap i need the size of the team shirt they will receive, please remember that these are spanish sizes and i would recommend going one size up i.e. if you want large then go for extra large as you wont have time to diet before the match!! Today’s last major of the year was the seniors trophy for players 55 and over, sponsored by Sandy & Dorothy Simpson. It seems that it was a very popular event with 79 players, with 67 of them the old guys and gals! Perhaps the population of Condado is getting older, but maybe Darwin’s theory of natural selection will reduce the numbers? Just to mention that although we had 79 players, a few didn’t arrive, or cried off after the Wednesday meeting at 8pm. This meant that many players who wanted to play were refused entry and were denied a game. This is not acceptable, but what is the solution? Autumn has arrived, and it was quite chilly at the start of play with some players wearing waterproofs to keep warm, but it soon changed to our normal Spanish sunshine. The yellow markers were still on the proper tees, but at the front as opposed to the back as in the Viking Cup. The phrase most was – did anyone see where that went? – answer – yes, but I can’t remember! It was the end of a really busy week for the society, with 80+ last Friday, and almost 40 on Monday – not to mention the 92 players in the Viking Cup Tuesday! (both teams looked fantastic in their contrasting red & white colours). Great business for IRM with over 200 players delivered from the society in one week. a full house for the seniors presentation…..
and the winner is……… Blair……………..
Geoff finished runner-up for the main prize, and was also nearest the pin on the 7th……. 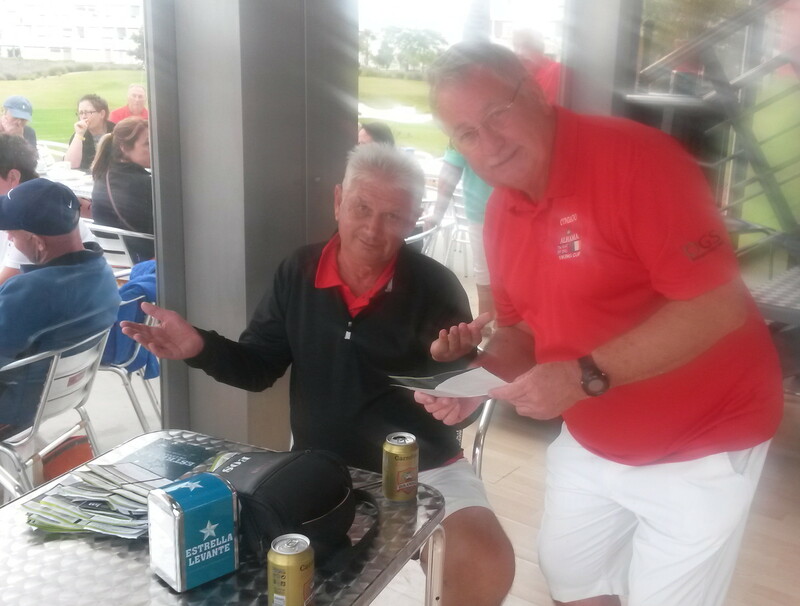 Terry was the winner of division one………..
Sausage Dave won division 2 on countback…. Jim is runner-up in division 2…………. Asbjorn was 3rd in division 2…………. Eli won the ladies division……………..
we caught up with the winner of the wooden spoon………………..
And from out on the course………………………. Les Hurren is in panto this year in Bedford…….the sugar plum fairy……………. Peter Reeves is colour co-ordinated – green stripe with the socks, blue stripe for his eyes, and red stripe for his underwear ……. No apologies for adding this late news………….our friend from the golf shop, Paqui, who has been with us since day one, got married on Saturday. Alicia & Kim were honoured guests, and provided us with some beautiful photos…………………..
Congratulations from all of us at the golf society Paqui! Next week is a pairs stableford event. More pictures from the Viking Cup to follow shortly. the UK & Ireland team after the game……..
UK & Ireland triumph against Scandinavia in the 6th annual event to level the competition at 3 wins each. the Scandinavian team looked very smart also………..
the UK & Ireland team were out in force on the practice ground…..
both sides join together as friends after facing each other in competition…. The evening presentation was a great success, with Peter Mitchell’s recommendation proving to be a great choice. Good food, great service, with free wine and 2 litres of beer per table included. Plenty of room for our 150 guests, who were transported there on 3 full coaches. Karen Noble was the singer, and soon the dance floor was full. Thanks were given to Alicia and Kim for organising the evening, and all the volunteers who handed out the free drinks and nibbles. The boss of the bar was not happy that we had brought our own refreshments, but I pointed out that the 92 players had been out on the course for 5 hours and would not have been served for quite a while with just 2 staff on. We still purchased drinks from the bar as things quietened down and kept the 2 staff fully occupied. it was only a few crisps, nuts & olives………..what’s the problem? Other thanks go to IRM who provided a rocket for the shotgun start and a trained operative especially shipped in from Mar Menor! Also they donated a green fee voucher for 2 players with buggy which was presented to the best pair. Although the yellow tees were under repair, Jonathan (head greenkeeper) allowed us to play from them on the day, and even put them as far back as they would go (didn’t help us, our 2 big hitters both lost their matchplay!). Also Paqui in the shop had to work under extreme pressure when she was given the teams on the Monday, which was only hours before green fees had to be paid (in the Clover). She then had to work out the price that each of the 92 players must pay, whilst still dealing with 130 players who were playing that day. Good luck with the weather for your wedding on Saturday – hope to include a picture of you in that wedding dress in next week’s blog! waiting for the bar to clear……………..
still a queue for drinks inside………………. a mass of red shirts waiting for room at the bar!……………. Phil Tann produced a great computer program which soon had all the scores tallied with the result only known to Phil, both captains and vice captains. 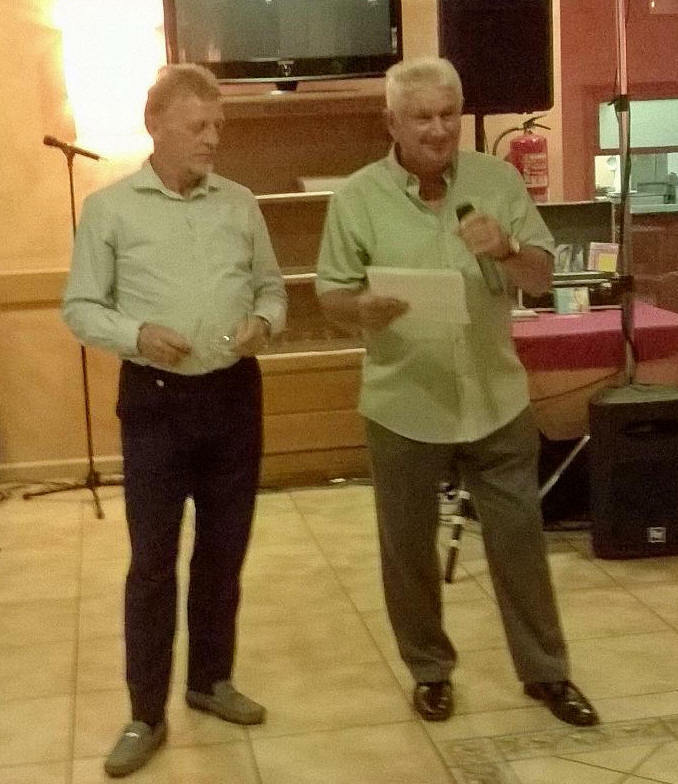 So when the individual and pairs prizes had been handed out, as Jan Skjold announced the scores in the matchplay, then the stableford (not mentioning the team) the suspense was broken when he said……..and the winners are……..UK & Ireland! The place erupted as the winners celebrated wildly. Again both teams were the best of friends, and this competition has developed into the biggest day of the society year. Back to 3-3 in the overall score, so all to play for next year. I have stood down as captain of the UK & Ireland team (with a 100% success record, 2010 & 2015! ), and next year Kevin Smith will take over, assisted by Neil Simpson. 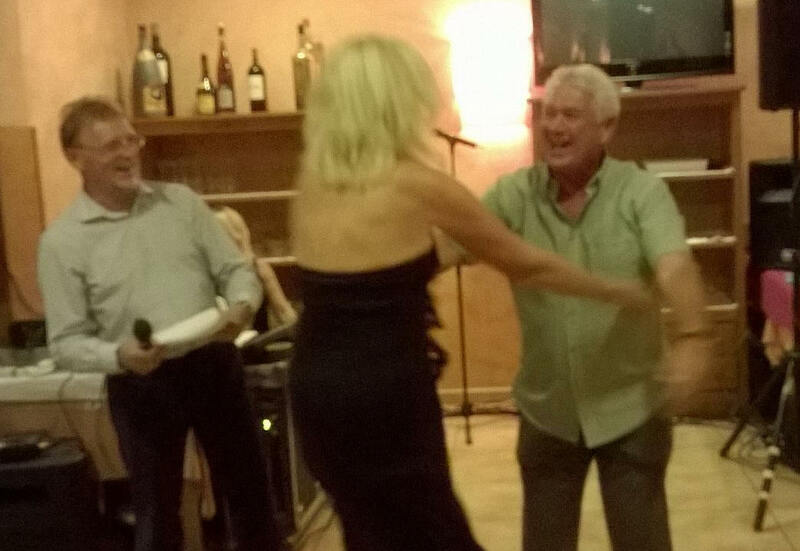 As already mentioned, La Siena was a great venue and here are some pictures of the night………………. Jan & Barry with the prizes and THE CUP! individual & pairs prizes were announced first…..
Peter won the individual prize………. Asmund and Tore won the best pairs……. 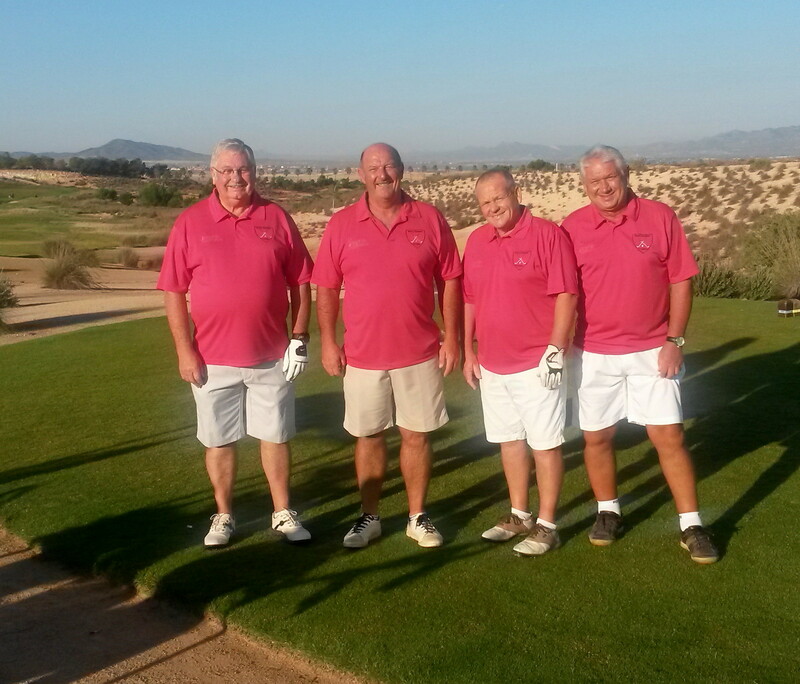 Dave and Terry were in 2nd place……..
Lis and Kirsti took 3rd best pairs……..
Karin won the par 3 prize………. Sue was nearest in 2 on 15…………..
Alicia was excited when the result was announced………..
and the winners went wild…………. Neil, Adrian and Kam celebrate………. it was all a bit too much for the poor chap……. Ken and Dave both lost their matchplays, but all that was forgotten………..
the 2 Jeffs with Dave Storey & Terry Burgess…..
Jeff Lightle, Jeff Cotter and Ricky Comber proudly hold the trophy……..
Will post the photos of the team pairings ASAP. Another year over, looking forward to the next one……………who will take the lead in 2016? Bernie struck a blow for the ladies, the seniors and the Irish! This week was the last Dublin Crystal of 2015, and Paul Culligan has kindly offered to continue his sponsorship of the competition through 2016. The competition had a fantastic entry of 81 players, and was played with cloud cover early on, and the usual hot sun breaking through later. Robin was the division 2 winner………..
and Kirsti won the ladies prize……………. looks like a day’s shopping aroun Lidl for Jeff Ruellan……..
looks like an electric shock around Dave Crosland’s cap….he certainly had a shock when his putt on 13 hit Jeff’s ball for a two shot penalty……….. The first and 2nd Aguilon Ryder Cup qualifiers took place last week, and we have 4 of our members in pole position at the moment. Another chance to qualify on Friday 23rd. Phil Tann tees off from the yellow tee on 12……remember that is the green I hit with a driver from the back last week…….he hits the buggy path 40 yards to the left of the green…………. and this is where it finished after an amazingly lucky ricochet off the kerb!……..
Les Hurren was not so lucky…….looks a tricky 2nd shot for his birdie on 12……..
maybe it was a fluke last week off the back markers…….my 8 iron off the yellow tee finished here………. Next Tuesday is the Viking Cup. All players should attend at the Clover bar on Monday at 7pm to pay for their green fees and meals (if not already done). Green fees are: 40€ walking, 45€ with buggy and 8€ as a member. Meals are 12.50€ each plus 5€ for the bus if required. Try to have the correct money if possible. Barry & Phil will collect green fees for UK & Ireland to the left of the bar and Jan & Jan will collect Scandinavia at the other side of the bar to reduce congestion. Alicia will be available for meal money and Kevin will also collect any membership renewals necessary. Also players will know their partners, opponents and tee positions after this is complete. Tee off at 09.30 (shotgun start), but be at the clubhouse for 09.00 as some players have a long trip to their respective tees. The evening presentation is at La Siena restaurant in Mazarron town, a venue that we have not used before but comes highly recommended. There should be an extra blog next week with such a lot happening at the Viking Cup. On Friday we have our last major trophy of the year, the seniors trophy for players 55 or over. Thanks to Sandy and Dorothy Simpson for sponsoring this competition. This week the forecasted storms did not appear, and the warm sunshine coupled with a windless day made for excellent conditions for the 58 players (which included 11 ladies). There could have been a record entry but for 28 members travelling to the Aguilon Ryder Cup qualifier the same day. 3 players tied for the trophy, but it was decided on a little known decider – with Dorothy Simpson and Eamon Barry having the same score on the back 9, the back 6, the back 3 and on the last, the countback went their scores on stroke index 1 – again a tie! So onto stroke index 2, where Eamon finally triumphed. Congratulations to Karen Simpson who took 2nd place in the ladies section with 37 points after winning the booby prize last week in the Barry Answer trophy! I did not get back from Aguilon until 7.30pm so we had to rely on photos of the winners from a mobile camera, also Neil wasn’t there to dim the lights! Notice the stranger on the photos? Yes, Phil was drafted in to assist Dave in presenting the prizes! Eamon just managed to scrape in to win the title…………..
Brian matched the best score but it wasn’t to be………. Dorothy continues her good form from the spring when she was last here, but so close yet so far away………….. So, as I was at Aguilon I will include a few snaps I took. They have a choice of 4 teeing positions – blue, yellow, white and black. Unfortunately, I think I made the wrong choice of white (so I could get another 5 strokes) as my score of 14 points testifies. (but I had one memorable hole to make my visit worthwhile!). Thanks to Chris McAllister for recording the event. even Chris needed a wood on the intimidating 12th …….but came up just short…………. I am thinking, why on earth did I choose the back tees?………there is absolutely nowhere to land the ball even if it is long enough, goodbye ball……..
well, that wasn’t so hard, was it?……………..
from the tee the walk down the steps, over the bridge, up the steps was a bit Indiana Jones………. Next week is the Dublin Crystal stableford. Sorry for any confusion, as the diary showed a team event. It was re-arranged way back in January but unfortunately has not been picked up until now. The following Tuesday (October 20th) is the 6th annual Viking Cup with 92 players starting at 09.30 with a shotgun start. There will be a meeting of both teams in the Clover at 7pm on Monday the 19th in the Clover, where all green fees and entry money will be collected – the shop couldn’t cope with so many green fees to be paid at the same time. 40€ green fee plus 5€ for a buggy, members 8€. Also Alicia will want all monies for the evening meal to be paid before we go to the restaurant. 12.50€ for the meal, 5€ for the bus (3 buses booked). Following this we will announce the pairings and the tees that they will start from. Players will need to be at the clubhouse by 9am and ready to set off to their tees (buggies will be allocated the tees furthest away from the clubhouse). At the moment UK & Ireland have 10 buggies, but Scandinavia only have 1. If you require a buggy please inform Jan Skjold ASAP as we cannot match up the pairings until we have this information. Team colours please – UK & Ireland red shirts and white shorts, Scandinavia white shirts and red shorts. Good luck to all the players, may the best team win. a good idea at playa serena……….club spectacles……. think Neil needs to go on a diet…….that is the damage to his chair – can see a claim going in……..
Denise gets her birthday cake a couple of hours early…………..
and in 4th place was geordie Stevie……. Adrian got a prize in division 2……..
and Karen finished last…….but got a very nice headless chicken headcover………..
Robbie James provided the entertainment……. Dave did his usual (it’s not unusual!) version of Delilah…………..
Maybe the Geordies and Scots were once one nation with tribal dances like this…………Peter is doing a war dance with a bit of viking and also a touch of the maori haka, and it looks like Kim is out for her morning jog a little early………………..
Alicia has asked for this message to be posted for those attending the evening presentation of the Viking Cup. Please let me know your menu choice and pay for your ticket before 8pm on Friday 16th October. Cost of ticket 12.50 euros plus 5 euros for the bus fare to La Siena restaurant in Mazarron Town, entertainment by Karen Noble. Bus leaves the Al Kazar at 1900 and returns at midnight.